I told y'all I've been on a pastry kick lately and I meant it. This week? 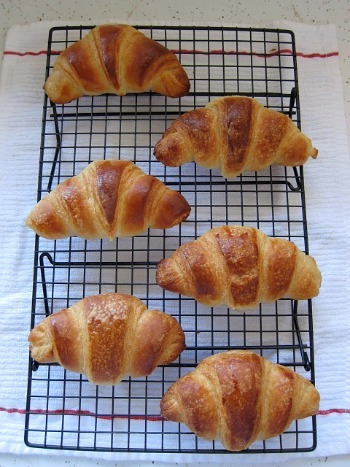 Light, buttery, flaky, delicious homemade croissants. I know what you're thinking...I just went from training wheels to unicycle. Well, you're right...but see the thing is, I like a challenge and what could be more challenging than the labor of love that is fresh croissants? Preparing croissants can be summed up quite simply: pound, roll, roll, place, fold, roll, fold, fold, roll, fold, fold, chill, roll, fold, fold, roll, fold, fold, chill, cut, chill, roll, measure, cut, shape, proof, bake. Phew! Now take a break and go to sleep..
you have to start all over again..
Now all you've got to do is proof the lil guys..
pop em in the oven and bake them. I must give a big thanks to Julie over at Willow Bird Baking and the Tracey of Tracey's Culinary Adventures, because without their photo tutorials I wouldn't have been successful as I was this first go around. Now for those of you still reading for the recipe and actual tutorial, be fair warned.. this is an extremely long and lengthy recipe, I'm talking two days long... but let me also say that these little french super stars are well worth the time and effort involved. Let's get started! The following process is a combination of Julie's instructions and Tracey's. Round 1: Making the Dough. Stir together warm milk, brown sugar and yeast in mixer bowl. Let stand about 5 minutes or until yeast has foamed. *Very important! * If your yeast doesn't start to foam you need to start over. The mixture has to get foamy for the yeast to work so you get light and fluffy dough. Add flour and salt, mixing with dough hook at low until dough is smooth and very soft (about 7 minutes). Transfer dough to lightly floured work surface and knead by hand for about 2 minutes, adding more flour when necessary, making a soft and slightly sticky dough. Form dough into a roughly 1 1/2 inch thick rectangle, wrap in saran wrap and chill until cold, about an 1 hour. Round 2: Pounding the Butter. About 40 minutes until chilling your dough its time to pound your butter. Line your work surface with a big piece of saran wrap, short side in front of you. Remove your butter from the fridge and lay the sticks horizontally on the saran wrap so their sides are touching. Fold saran wrap back over butter so its completely covered. Using a rolling pin, pound the butter to soften (it should be malleable, but still chilly). Pound and roll out on both side until butter forms a uniform 8 by 5-inch rectangle. Transfer to fridge to chill. By this time your dough should be ready to roll out. Round 3: Rolling out Dough. Unwrap dough and roll out on a lightly floured surface, constantly during with flour when necessary- liftng and stretching dough into a 16-by 10-inch rectangle. 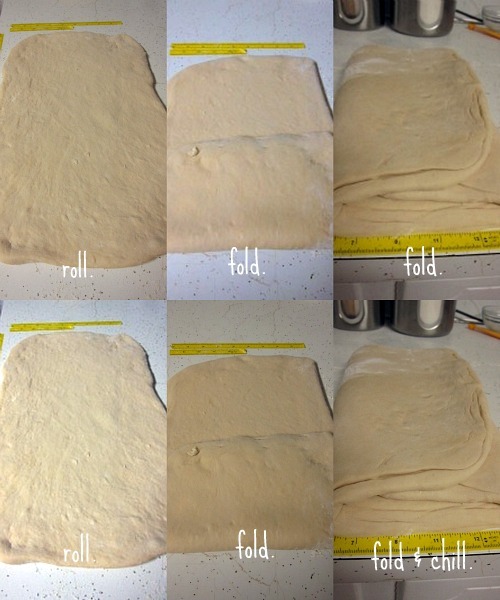 Arrange dough with short side nearest you. Get the flattened butter out of the fridge, remove from saran wrap and place it in the bottom half of the dough rectangle, so that the long sides of the butter are parallel to the short side of the dough. Fold top half of dough over butter, pinching edges of dough together so butter stays wrapped inside. Gently pound and stretch rectangle of dough and butter, into about a 10 by 6-inch rectangle. If your butter is started to ooze out, sprinkle it with some flour or take a break and place dough in the fridge for a little bit to chill out. Again, with shortest end closest to you, fold dough like you would a letter: Fold bottom third up and top third over bottom third. Like so..
Pat yourself on the back! One "Turn" is complete! Turn dough so that the folded part (like the spine of a book) is on your left. 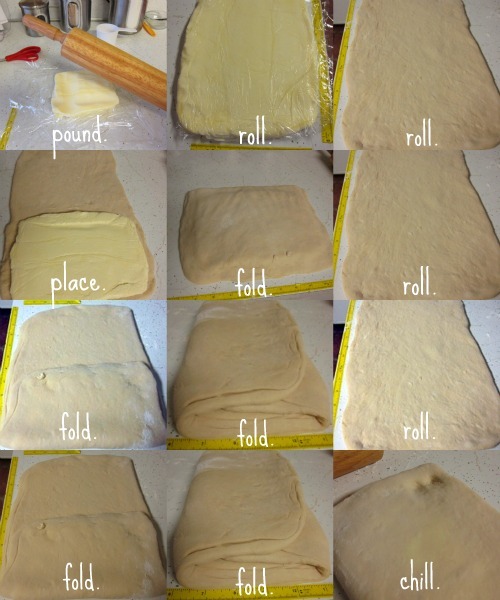 It's now time to start "Turn 2"
Repeat the process shown above- rolling out dough into a 10 by 6-inch rectangle and then folding like a letter, bottom third up, top third down. You have now completed 'Turn 2." Use your fingers to make 2 imprints on the corner so you don't lose your place..
Wrap your dough in saran wrap and place in the fridge to chill out for about an hour.. in the mean time go grab something to drink. Once the dough has been able to chill out for an hour or so, complete two more turns- just as you did before, for a total of four turns: Turn 1-Roll, fold, fold Turn 2- Roll, fold, fold. At this point, you've done all you can for the time being. The dough needs to chill for about 12-20 hours before proofing. So go have dinner and have a nice night of sleep because you've got a lot more to do tomorrow morning! Before beginning, line two baking sheets with parchment paper and get that ruler handy yet again. Get your dough out of the fridge (you'll notice it may have grown a little) and using a dough knife, cut in half. Wrap one half of the dough and place it back in the fridge, because you want your dough chilled its important not to try and do too much at one time. Round 4: Preparing your Croissants. Arrange your dough so the long side of the rectangle is directly in front of you. 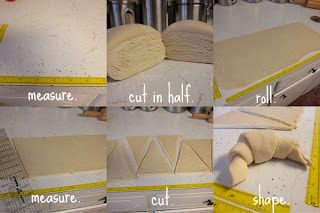 The next step is to cut your dough into triangles that will be used to form the croissants. 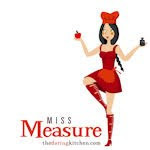 On the side closest to you, use your ruler and starting from the left side of rectangle measure 5 inches from the end and make a tiny incision. From there, measure another 5 inches and make another mark, and repeat one more time- finishing with four 5-inch sections. Now along the top, measure 2 1/2 inches in and make a mark. Then measure 5-inches from there and make a mark. Repeat two more times, measure 5 inches each time. If you're having a hard time wrapping your head around this check out this diagram..
You're now ready to cut you dough into triangles. The 5-inch sections are going to the bases of your triangles. Starting at the bottom corner, use a pizza cutter and cut ending at the 2 1/2 inch mark. Then cut down toward the first 5-inch mark you made, creating a triangle. Continue diagonally cutting meeting mark to mark until you have 7 triangles and 2 scrap sides. This diagram may be helpful. Make a small cut at the base of each of your triangles. Holding your triangle, stretch the dough a little on the corners of the base. Place the triangle back on the work surface and roll base toward tip, curling the sides of the triangle away from each other (towards you) to create the crescent shape. 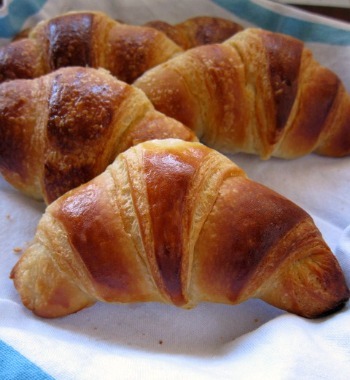 The croissant should roll 3 times with tip sticking out. Curl ends toward each other to get more of crescent shape and press together if desired. Repeat process with rest of your triangles and place back on baking sheet about 2 inches apart. 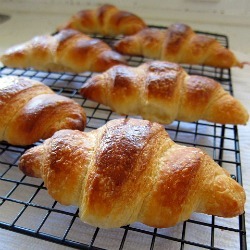 Make egg wash (egg yolk and cream) and generously brush shaped croissants. Repeat Round 4 and 5 with reserved dough waiting in the fridge. Looking for something to do with the extra dough that's been cut? Just roll it up too for little mini pastries, better yet add some chocolate or jam before doing so.. just go with it. I know by this point you just want to throw them in the oven and be done with them, but they still need a little more time.. I told you.. patience is a necessity. They're divas (but justifiable so). There are a couple ways to proof these little stars. I went the warm route, but other recipes call for a cool proof that consists of placing the prepped croissants in the fridge for about 3 hours or even overnight (I want to try all but just haven't had the time so I'm sharing what I did and what worked). Turn oven on to 100°F (or as low as your oven will go). After a few minutes, turn oven off and open the door. When the temperatures drops to just warm, place croissants in the oven and close the door (I kept the oven light on as well). Leave croissants in the warm oven for about 2 hours, until they are about 1 1/2 their size and have the texture of a marshmallow- if you touch them there will be a slight indent. 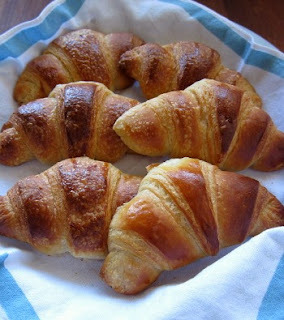 After 2 painful hours have come and gone, remove croissants before heating the oven for baking. At this point I also dabbed the excess butter that had started to pool around the bottom of the rising croissants- not because I was trying to be healthier, but because I didn't want the butter to burn while baking. Preheat oven to 425°F and place an oven proof dish full of water on the bottom rack of the oven. Put croissants (one pan at a time) in oven and immediately reduce temperature to 400°F and bake for 8 minutes without opening the door. Rotate baking sheet 180° in oven and reduce temperature to 375°F, baking until golden brown- about 8-10 minutes. Don't be tempted to take them out when they're light brown.. they may not be done! We're looking for golden outsides. Holy Moly...you're done! You did it! You made your first batch of croissants!! Now you totally deserve eating at least 4. 1. First off, if you have ANY questions please don't hesitate to email me or find me on twitter! 2. Definitely allot enough time for the whole process.. like I said before, I started the process around 6pm Friday evening, woke up around 7am Saturday morning and didn't get to enjoy croissants until about 10am. 3. Don't get caught up in the measurements when rolling out the dough.. if you can't get the inches exactly, try to get as close as you can and work with it.. don't force it. 4. 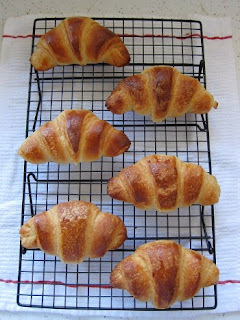 If you see smoke billowing from the oven while the croissants are baking don't freak out!! It may not be the actual pastries.. You might have to turn on a fan or open a window (or two) to make sure your smoke alarm doesn't go off, but more than likely it is just the excess butter oozing out and burning at the bottom of your oven- if anyone has any suggestions to keep this from happening, please, I'm all ears!